technology empowers learners and prepares them for the workplaces of the future. those with the skills to benefit from technology use from those without. Rows of silent students completing digital worksheets on their Chromebooks or iPads is not effective technology integration. Using one-to-one tablets to complete weekly multiple-choice quizzes simply replaces paper, pencils, and grading. One means of effective technology integration is through literature circles, a collaborative and student-centered reading strategy. In traditional literature circles, small groups of students gather to discuss shared readings. 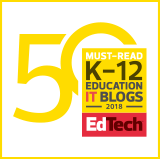 Students assume rotating roles, typically as the “discussion director,” “ literary luminary,” “vocabulary enricher,” and “connector.” In a technology-enhanced literature circle, these job assignments are infused with technology tools.